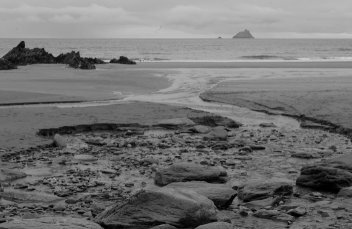 This is a fitting conclusion to the album as it touches on most of the poet's favourite themes - stories and legends, the wild beauty of South Kerry, youth and old age and the mental merging of man with the music and rhythm of the place he loves. Guaranteed to soothe the furrowed brow! Sigerson's own notes on this read - Diarmuid with Fionn, Oscar, Conán, Maol, Caoilte and Naoise was one of The Fianna, the great fighting-men of Pagan Ireland. Iveragh: a barony in South Kerry. Deirdre: The most beautiful woman in Irish legend. Caoining: keening or wailing. And Deirdre caoining upon Naoise's grave. Brought Patrick to mind Miolchú's swine.